Germany’s Ole Schemion wins the World Poker Tour Season XVI European Championship. The World Poker Tour Season XVI European Championship Berlin came to a conclusion on Monday as the remaining six players from the 339 starting field, took their seat to battle for the €218,435 first-place prize and the title of WPT Champion. The €3,300 televised Main Event was held at Spelbank Berlin and it was the first time the WPT had held a Championship event on German soil. Therefore, it seems only fitting that one of the best players on the planet, Ole Schemion who hails from Germany, took over the tournament and rode a wave of momentum right into the winner’s circle. Schemion entered the final table with the chip lead, something he had held for the past two days. He used that leverage to eliminate four of the other five players, including Czech Republic’s red-hot Michal Mrakes, standing in his way to victory. It took nearly two hours into the six-handed final table for the first of the finalist to hit the rail. After 37-year old Amjad Nader was crippled down to 6 big blinds on the hand prior, he pushed with . Schemion flatted with the as did Mrakes with the . The flop came and Schemion put out a bet that drove Mrakes out of the pot. When the hit the turn, Nader was drawing dead and as the inconsequential completed the hand, Nader stood to collect a career-high cash of €39,010 ($47,323). Born in China, but living in Germany, Hanyong Kuo entered the final table third in chips. Kuo made a gutsy king-high bluff-catching call for the majority of his stack only to be shown ace-high, leaving him with only five big blinds. Four hands later, he’d make his final move of the tournament by shipping into the surging Schemion who isolated with . There was no help to Kuo, a veteran Pot-Limit Omaha cash game specialist, when the board ran out all blanks for both players leaving Schemion’s ace-high as the best hand. Schemion claimed another victim and Kuo claimed his fifth-place prize of €46,705 ($57,118). A mere two hands later another elimination took place as Germany’s Michael Behnert took his ten big blind stack and put it in the middle from the small blind holding .,Patrice Brandt made the call from the big blind with . Behnert’s 3:2 advantage quickly diminished on the flop. But when the turn came , Behnert picked up backdoor flush outs in addition to his two overs, essentially giving himself the same odds Brandt had at the beginning of the hand. But the was of no help and Behnert, who entered the day fifth in chips, laddered to fourth place and took home €60,730 ($74,088). Brandt himself would be the third elimination in five hands as he took his made a stand with his roughly 30 big blind stack against the tournament boss, Schemion. Brandt raised the button with only to be three-bet by Schemion from the small blind. Mrakes folded the big blind and Brandt called to see the flop. The flop dropped . Schemion bet around one-third pot and then, with his two overs and a flush draw, Brandt committed the rest of his chips. Schemion made the call and tabled . While Schemion’s gutshot straight draw and ace-high was the best hand, Brandt was a slight favorite when all the cards were exposed. But it was Schemion’s day and a pair of bricks in the form of the and sealed Brandt’s fate. Schemion had eliminated his second player with ace-high. Brandt finished in third despite entering the final table with just over 15 big blinds. He earned €93,105 ($115,077) for the result. After a 30-minute break heads-up play began with Ole Schemion holding roughly a 2:1 chip advantage over Michal Mrakes, who had entered the final table second in chips. An early full house for Schemion extended his chip lead and the Germany superstar never looked back. Twenty-one hands later the pair would mix it up on the final hand of the tournament. Schemion raised holding the , Mrakes three-bet with and was called. When the action flop of hit, Mrakes made his move and pushed. Schemion ultimately made the call. The pair watched as the hit the turn opening Mrakes outs to include an inside straight. But the shut the door on Mrakes comeback bid and awarded the hometown hero, Schemion, the victory. Mrakes finishes as the runner-up, winning €143,845 ($178,892) for his third career six-figure score. Ole Schemion added to the accolades of his remarkable career that includes over $13.5 million in tournament cashes. 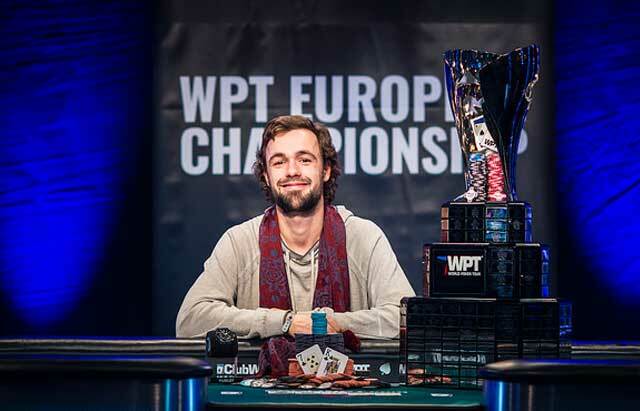 Now in addition to his victories in the Aria High Roller series, the Partouche Poker Tour Championship and EPT Monte Carlo Super High Roller, Schemion can now call himself a World Poker Tour Champion. The title includes an entry into the World Poker Tour Tournament of Champions at the Aria Resort & Casino in May, a Hublot Big Bang Steel timepiece and, of course, €218,435 ($255,352) for his first-place prize money.